Today, we will be discussing our choice for the Best Dutch Ovens To Buy In 2018. In this list article, we will also be discussing each Dutch oven’s specific main features as well as the pros and cons of each. If you are in a rush and would like to know our top pick straight away, it’s the Lodge EC6D43 Enameled Cast Iron Dutch Oven. This Dutch oven offers the benefits of cast iron durability with the versatility of an enamel coating. With that said, if you would like to head on over to our full review of the Lodge EC6D43 Enameled Cast Iron Dutch Oven, then click here. The Lodge EC6D43 Enameled Cast Iron Dutch Oven is a definite cut above the rest. It offers top-notch quality as well as versatility and ease of use. Furthermore, this Dutch oven is extremely easy to clean and maintain. Likewise, with a 6-Quart capacity, it will be perfect for pot-lucks, parties, picnics, and much, much more. 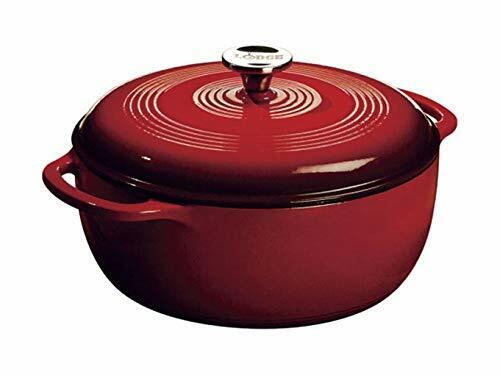 Available in many vibrant and durable colors, the Lodge EC6D43 Enameled Cast Iron Dutch Oven will not only last for generations but also add style to any home it’s used in. And, on top of all of that, it can be used for oven cooking with temperatures up to 500-degrees Fahrenheit. Here are some other notable features. All in all, the Lodge EC6D43 Enameled Cast Iron Dutch Oven will add an enormous amount of value to your kitchen. And at an affordable price, you really can’t go wrong. Furthermore, with a company like Lodge to back it up, you really can’t lose. The Lodge Seasoned Cast Iron Deep Camp Dutch Oven is not only well-built but also well-priced. On top of that, this Dutch oven will quickly become your outdoor cooking tool of choice. And the near non-stick cooking surface will hold in flavor and moisture for hours. Measuring 5.5 inches, this Camp Dutch oven is extra deep compared to similar outdoor cooking brands. And the super-sized 8-Quart cooking interior will ensure that a whole troop of hungry mouths will be satisfied. Along with its generous size, this Dutch oven is also very satisfying and simple to use. Furthermore, you’ll be able to keep food hotter, longer by placing hot coals on top of the included lid. This will keep food hot and ready to serve at a moments notice. Last but not least, is the topic of clean-up. And boy is this Dutch oven easy to clean. Simply hand-wash and dry, making sure no moisture is left on the pan. Finally, keep the Dutch oven stored in a clean, dry area ready for its next use. 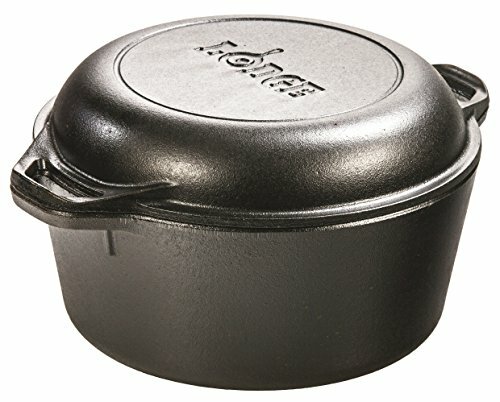 Coming in at number 3 is the Lodge L8DO3 Cast Iron Dutch Oven. This 5-Quart classic is perfect for small to medium-sized families. It offers all of the benefits of cast iron, in a smaller package then our number 2 choice above. 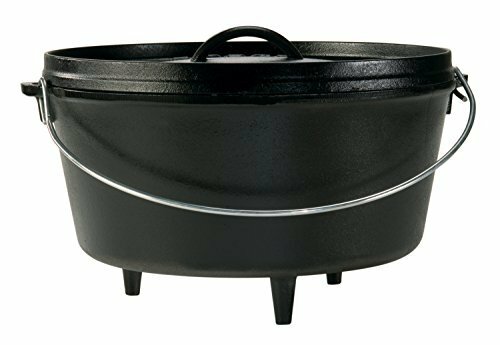 The Lodge L8DO3 Cast Iron Dutch Oven comes equipped with an easy to grasp metal coil handle that makes transporting from stove to table both safe and easy. And the tight-fitting lid creates and holds in moisture and flavor. The ability to use this Dutch oven in the oven, on most stovetops, and even outdoors is a definite plus. Furthermore, you’ll be able to seer meats on to stove, then finish cooking in the oven for perfectly cooked meals every time. 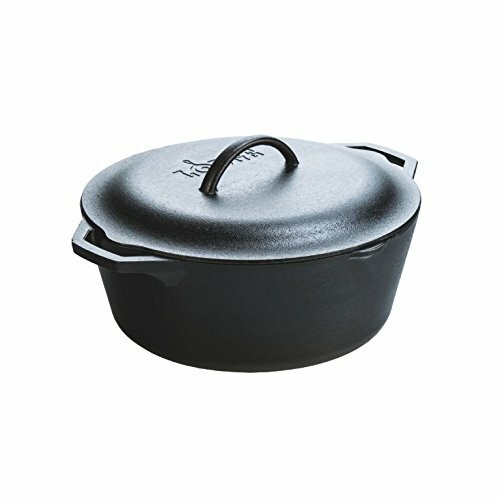 If the Lodge L8DO3 Cast Iron Dutch Oven peaks your interest and you would like a more detailed review, then click here. What can be said about double Dutch ovens that haven’t already been said? They are simply amazing pieces of cookware. Not only are they Dutch ovens, but the lids pull double duty as griddles or skillets. Furthermore, these versatile cooking tools can usually be used outdoors as well. This includes cooking over open flame heat sources such as campfires and grills. And the Lodge L8DD3 Cast Iron Double Dutch oven is no exception. This 5-Quart Dutch oven comes with a lid that doubles as a 10.25-inch skillet. With this handy extra piece of cookware, you will be able to prepare 2 separate meals with ease. For instance, make oatmeal in the Dutch oven while you cook eggs and bacon on the skillet lid. What could be better? The Lodge L8DD3 Cast Iron Double Dutch oven is not only very affordable but also versatile as well. The ability to effortlessly prepare 2 separate meals at once will definitely come in handy, especially with larger families. If you would like to learn more about the Lodge L8DD3 Cast Iron Double Dutch oven, then check out here. The 7-quart Lodge L10DOL3 Dutch Oven will be a welcome addition to any outdoor cooking experience. Solidly built and large enough for even the biggest hungry groups, this Dutch oven is a must-own product. The superior heat-retention properties of cast iron coupled with its rugged design will be at home at any campsite or cookout. The self-basting lid will aid in retaining heat, moisture, and flavor. And the solid dual handles will ensure a safe and comfortable way to transport. Safe for all cooktop types as well as oven and outdoor use, this Dutch oven is a jack of all trades. And if you are concerned with cleanup, don’t be. Simply remove the large food particles that remain and then wash with hot water. Then, hand dry and you are all set, it couldn’t be any easier. I know this is a no-brainer, but the discussion of build-quality cannot be overemphasized. This is a core quality of any piece of cookware. If it doesn’t last, then why bother. So, what are some things to look for? Well, for one, thickness and weight are a good indication of at least some bit of quality. And while not every heavy or thick piece of cookware is of the highest quality, it can be a useful gauge if you are unfamiliar with the brand. Try looking name brand Dutch ovens if your budget allows for it. Furthermore, seek out other customer reviews as well as word of mouth to find a high-quality piece of cookware as well. Finally, make sure choose the material you are most comfortable cooking with. For example, cast-iron or stainless steel. Can your Dutch oven’s lid turn into a handy skillet or griddle? Well, if you have a double Dutch oven it can. Versatility like this is will not save you time, but the headache of having to use two separate pans as well. Another great multitasking feature is the ability to go from stovetop to oven with one Dutch oven. These types of cookware are pretty common and very handy. However, the next step is the ability to cook outdoors as well. Whether it’s in a campfire or over an outdoor grill, these Dutch ovens can do it all. And what’s more, is the fact that most of these products can handle temperatures above 500 degrees Fahrenheit. Be sure to keep your eye out for these versatile workhorses, they are usually constructed of very tough cast-iron. Let’s face it, no one wants to clean up after cooking all day for a hungry crowd. And we can all definitely relate. So, you need to look at Dutch oven’s construction and material used to get a product that is not only easy to clean but maintain as well. First of all, is cast iron. This tried and true material type makes excellent cookware. This is because it can handle high temperatures, can be used outdoors, and is relatively simple to clean and maintain. Cast iron cookware does, however, need continual re-seasoning with cooking oil, but it’s totally worth it. Ceramic enamel cookware is usually used to cover cast iron. This material type is both easy to clean as well as very heat resistant, though not as resistant as plain cast iron cookware. Furthermore, enameled cookware as expected is prone to breaking if dropped or mishandled. However, just hand wash using soap and water and you are all set. And there you have it. Our top 5 picks for the best Dutch ovens to buy in 2018. These Dutch ovens were difficult to place because we feel they are all top-tier products. So, whichever Dutch oven you choose, you really can’t go wrong. Furthermore, these are the best of the best in the affordable price range, in our opinion, of course. So whether you choose our top pick or our 5th pick, know that quality, versatility, and value are core to all of our Dutch oven choices. With that said, we would like to thank you for your time and support. And we hope this top 5 article will aid in your decision and help you find that perfect Dutch oven. If you would like to see our top picks, then feel free to check out our Top 10 Dutch Ovens review article. Thank you again for your time and as always, please take care. How To Clean A Cast Iron Dutch Oven?